and in North Broward County." ever faced in a peace year,"
man Keiner (right) and Vice Chairman Victor Gruman. his top aides in Israel. Nusbaum, Rabbi Leonard Zoll, Rabbi David Berent, Jeffrey L. Klein. Jeanne Daman's Message: Don't Stop! the flame will always burn." Springs. They termed the Nov.
North Broward County. With your help, we can. 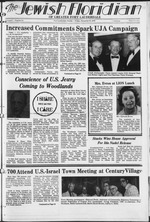 subscription to The Jewish Floridian. leader of the Dec. 5 meeting. further study of the Nazi era. president of the Plainfield, N.J.
For generations a symbol of Jewish .radition. scheduled for 10 a.m., Tuesday. Center, 9101 NW 57th St.
them: "Now, more than ever,"
Kenneth B. Bierman, campaign director. breakfast to be held Sunday, Feb.
significant as the death of a loved one. funeral chapels. And that makei the difference. With chapels in Sunrise, Deerfield Beach & Margate. again, Sadat is rewriting history. human life, even in times of war. one degree or another, have. already suffering the grim effects ! Who is Israel's Top Millionaire? himself a lovely home in Savyon. were usually (not always) sound. fields of health and religion. properly be called an Israeli. Fort Lauderdale will be held. who have much to fear." Avi Okun in his studio. price in that time slot. evolution of his life as an artist. serving as the Embassy Towers. Council of B'nai B'rith Lodges. raising committee of the U.S.
H7I B. J. Rynold Tobacco Co.
Women, having Mrs. Louis L.
Itefowich. 3850 Gait Ocean Drive. Thrift Shop at a new location. Israeli will have David Sidman. meeting in Temple Beth Israel. to Jack Kelter, chapter president. '..; : ! :: '; -. '* ki- '-. interest rates allowed by law. ..ceding SI 6 billion listed and trod.d on the New York Stock E.chenge f^*-*. Admission Mat. S7.50 ... $6.50 Mil 2:30 p.m.
munity Center of Greater Fort Lauderdale. preciation to W EC ARE's general chairman. Heine, Mrs. Rieferson, and Mr.
Dec. 9, with a matinee at 2 p.m. Lesser and Ina Goldstein. Dr.
Ronald Wellikoff is the director. are available at JCC, 792-6700.
starting a club in your condo? for a true Center facility. was centralized there for JCC. Perlman Campus at 2 p.m..
of Israel," and Ivy Levine. The club will meet at 1:30 p.m..
during their stay in our area." director of "Here Is Israel,"
sented during its current U.S.
Tickets for "Here Is Israel"
are Abe Tuchman, Mr. and Mrs.
High School Band for music. A Better Way o! Life, You Couldn't Find. member of the founding family, and David Jackowitz, current president. evening of remembrance, enter- and a cruise. tans of auctioning vacation Temple Beth Israel, 7100 W.
involved in a foods unit of study. Fund to insure its success. Mrs.
for school on Friday after 1:30. All meals will be dairy. Jackowitz, and his wife, Sondra. dream and not become a reality." Coffee. Its rich, satisfying taste is have been serving it for half a century. lHadassah Rayus Group of W.
Ueieke Hall noon to 3 p.m.
Hu.iUuy Bu<:aai 11 a.m.-3 p.m.
Mulluia Paik 29lh St. 8:30 p.m.
Meeting and party 8 p.m.
our area direct from Tel Aviv. for one show only on Saturday. formances at 2:30 and 8 p.m.
At a reception in Algiers. 'LO's UN office in March 1977.
of State John Foster Dulles who. Dedicatory Tablets. Original Sculpture. Etc. N. Ocean Blvd. 12:30 p.m. I lulu auoi 7.45 p.m..
onow. Avi Okun 11 a.m. to 7 p.m.
Is One Of The Best ThingsThats Happened To Me! Woodlands home of Mr. and Mrs. Mid Coast Kegion of Hadassah. luncheons the rest of the week. at the Inverrary Country Club. Who Will Be Jewish in the Year 2000? earlier this month along with Dr.
publishers of Near East Report. is below the replacement level. .
Rev. Simon Schoon of Holland. will be served at 9:30 a.m.
Dec. 2, at 7 p.m. at the temple. behalf of the people of Israel." Camp Committee of the JCC. mnity and the State of Israel. the Israel Solidarity Award. Dr.
B'rith, Freo Sons of Israel. them from seeking the light. AFFILIATED WITH SUPERIOR CARE, INC.
Court Judge early this month . Fourth District Court of Appeal. USSR in 1972 ... The U.S.
H. Gillon and Dr. Robert Grenitz. Century Village East, Deerfield Beach. as evidenced by its applause. Small portion of audience at Temple Beth Israel Town Meeting is pictured. Col ltu> mum! J 7B, of Oakland Park. ami inuny nieces and nephews. Mr.
ii.l, in Women s American ORT. i i ..-.. -urn i ! terests in the Middle East." outlined in an Oct. 11 speech. Israeli Embassy and 'lobby.' "
not being subservient to Israel. shakedown. Money is the cause. the Middle East and Israel is it. D Please send your brochure on lax-Ire* municipal bonds. pace lor tnc entire community. woven, "now, more than ever,"
among Jews, "one for another." juest s are invited to attend. iiml meet Rabbi Jeffrey L.
formation, call the temple office. the home of Dr. and Mrs.
iale, on Friday night, Nov. 30. 8049 West Oakland Park Blvd. are from 10 a.m. to 5 p.m. I'hanukah Festival on Dec. 15.
servative. Rabbi Albert N Troy. Conservative. Rabbi Morris A Skop. NW 9th St. Conservative Rabbi Dr.
jolomon Geld. Cantor Max Gallub. David Berent Cantor Joseph Pollack. Dec. 2, through Wednesday, Dec.
through grade 5 will be available. Shabbat Service on Friday, Nov.
the 8:15 Friday night service. On Dec. 1, at the 10 a.m.
Relations Award to James W.
and the worth of the individual. is among that group of agencies. in the world who are starving. Local and Out of Slat* Arrangement! will be held on Wednesday, Dec.
tment, 918 E. Hillsboro Blvd..
Park Blvd.. Jan 23, March 26. Ridge General Hospital, 5757 N.
Hospital, 401 NW 42 Ave., Dec.
We need people. We need you. than ever. To bring in more pledges than ever.